A South Korean activist holds up a banner during a rally to welcome Kim Jong Un's possible visit to the South, in Seoul, South Korea (Dec. 10, 2018). The banner reads "The implementation of Panmunjom declaration on April 27." Amid the inter-Korean thaw, it’s time to revisit the 70-year-old law against praising North Korea. Protesters clashed last month in the South Korean capital city of Seoul over a rally to welcome North Korean leader Kim Jong Un. 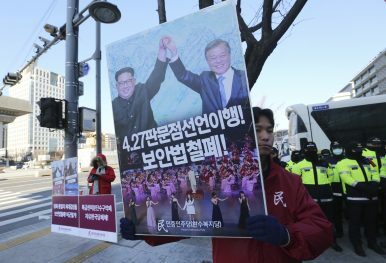 A civic group dubbed “Welcoming Squad for Great Man” held a rally on November 26 to express their expectation and excitement over Kim’s possible visit to Seoul. The rally also celebrated Kim’s efforts to normalize inter-Korean relations. Some of the protesters even shouted that they love North Korea’s communist ideology. The rally faced a backlash, both from a competing series of protests to stop the group as well as negative reactions onlines. Those who were not happy with the rally had different reasons for objecting to the group’s demonstration. But they had one thing in common: asking what happened to South Korea’s National Security Law. Since the two Koreas maintain an armistice, rather than having formally declared an end to the Korean War, behavior, speeches and remarks in favor of North Korea or its ideology is punishable through the National Security Law. At the same time, however, South Korea guarantees freedom of speech, press, petition, and assembly for its nationals. That contradiction means that the law’s implementation has heavily depended on each government’s stance toward the North. Given the current Moon administration’s desire to normalize relations with Pyongyang and signs of improving inter-Korean relations, it is an easy conclusion that the law’s authority has waned. Several recent examples back this up. There has been an increasing number of cases where South Korean courts reconsidered penalties imposed on people prosecuted for violating the National Security Law. In December, for instance, South Korea’s Uijeongbu local court commuted the sentence of a man who wrote online posts glorifying North Korea. The man, who is in his 50s, was sentenced to a year in prison for uploading 51 posts glorifying North Korea while criticizing South Korea and the United States between 2011 and 2016. However, the court decided in the latest trial to cut his sentence to nine months after it found him not guilty of some of the charges. The court explained that the man merely posted his statement online but did not convert his ideas into any action. The court also noted that he was not a member of any group that benefits North Korea. Another South Korean citizen, who was charged and punished for looking the other way with his North Korea-sympathizing co-worker, has recently been found not guilty after 43 years. This citizen was sentenced to two-and-a-half years in jail in 1975 for not reporting his co-worker, who made statements glorifying North Korean founder Kim Il Sung, thus violating the National Security Law. These examples and signs of change have been anticipated by those who believe the National Security Law undermines and restricts South Korea’s freedom of speech and expression. Amnesty International is one of those critics of the law. In one Amnesty report, released in 2015 when South Korea was under a conservative government believed to be in favor of the law, the organization urged Seoul to curb mounting restrictions on freedom of expression through excessive use of the National Security Law. “Authorities should ensure that the right to freedom of expression and association is stringently upheld. Any efforts to limit such rights must be proportionate and necessary to address actual threats to national security,” the organization argued. But is South Korean society ready to say goodbye to the law? The country’s main opposition Liberty Korea Party, now the conservative standard-bearer, says no. In the party’s latest discussion of domestic current affairs, one of the hottest topics was the necessity of enforcing the National Security Law. There is also public opposition to an excessive embrace of North Korea. District offices in Seoul have been swamped by public petitions and requests to take down banners hung across the city that glorify the North’s leader Kim Jong Un. Some even demanded that authorities punish those who install such banners. Discussing the National Security Law has long been seen as taboo in South Korea. But now might be the ideal time to do so, while it is the subject of both public interest and high-profile media coverage. South Korean Conservatives: What Now?Can South Korea’s 2 Main Parties Learn From Each Other? Seoul Is Testing US Patience Over North Korea SanctionsIn Trump and Kim Jong Un We Trust?Where Does South Korea’s President Go From Here?